Need a go-to Insta artist for waving and braiding hair tutorials? BTC Team Member @annette_updo_artist is always sharing her latest video quickies, go-to products and styling cheats—like that she uses a bigger curling iron at the nape and a thinner iron up top to create bigger volume in her waves. That’s why we’re sharing one of her recent Boho wavy and braided Insta videos below! Watch the quickie that received more than 300,000 views, then catch her styling steps for creating the look. 1. Wash the hair with Kenra Professional Detox Deflect Shampoo and Conditioner. Then, use the Kenra Professional Hydra Gel to prep for the blow-dry. 2. After the hair is dry, take upside down V sections from bottom to top and mist the hair with Kenra Professional Diamond Deflect Hairspray before curling the hair. 3. Using the Hot Tools Professional CURLBAR™ Set, curl the bottom sections using the 1 ½-inch bar and a thinner bar (like the CURLBAR™ set 1-inch wand) when working on the top sections. This technique results in more volume throughout the waves, creating a fuller-looking end result. 4. 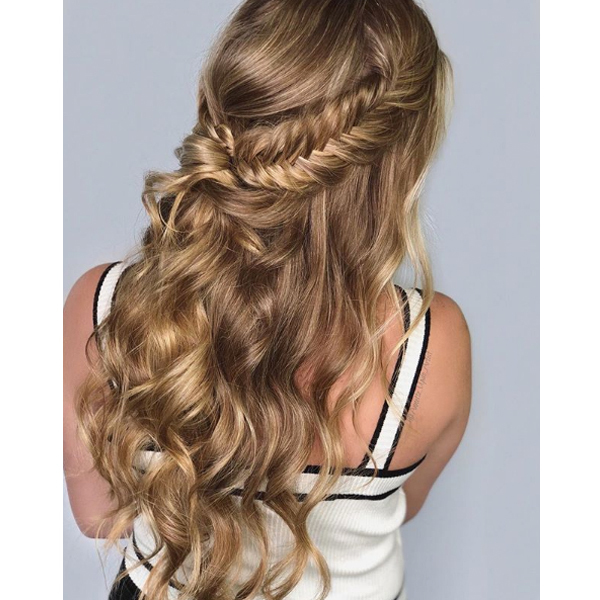 Once the hair is curled, take a 3-inch section on one side and start creating a fishtail braid. Once complete, pancake out the braid and then secure with an elastic. 5. Repeat the same step on the other side. Then, bring both sections back, crisscross them and secure with a bobby pin. Use a little section of hair from either section to wrap around and cover the bobby pin if needed. Create The Insta-Approved Waves You’re Seeing Everywhere!